The information is so powerful and important, that I have listened to it and read it several times over in order to fully internalize it. If you haven’t yet read or listened to the book, there is no time like the present! Why not finish out 2013 with the commitment to improving all facets of your life? Why not get your hands on every piece of literature you can, in order to cultivate your radiance? In 7 Habits, Covey explains that effective habits are internalized principles and patterns of behavior that will greatly improve your personal and professional life. These habits are common sense, but not common practice. 1. 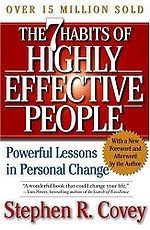 Be Proactive: Highly effective people make the decision to change their lives, rather than reacting to external forces. 2. Begin With the End in Mind: Develop a mission statement, both personally and professionally. 3. Put First Things First: Spend time doing things that help you accomplish your mission, and learn how to spend less time in chaos and laziness alike. 4. Think Win/Win: Seek agreements and relationships that are mutually beneficial. 5. Seek First to Understand, then to be Understood: Listen empathetically, rather than waiting for your turn to speak. 6. Synergize: Solve conflicts by finding a better, mutually beneficial solution, rather than compromising. 7. Sharpen the Saw: Take time for personal renewal, physically, mentally, emotionally, spiritually and socially. Since reading this book years ago (and continuing to refer to it often), I’ve implemented these principles in my life, and attempted (often succeeding) to make them habits. In doing so, I’ve strengthened my relationships and resolved small conflicts, not to mention helped cultivate a very successful business and a balanced, happy life. The seven habits are applicable and relatable to both your personal and professional lives, giving you strategies for building strong communication skills. No matter how evolved, we all have areas to work on and improve, and we all want better relationships and more lucrative businesses, right? Focused self-edification is integral to that betterment, because it all starts with YOU. So, do yourself a favor and spend ten bucks (and just 75 minutes if you do the audio!) to improve your quality of life. If the book inspires you, there are many more publications to further your mastery of the seven habits. I promise it will be time well spent.